The scene of the accident on Sunday. A Tauranga kitesurfer is expressing his condolences to the Gemming family following the tragic death of Logan Gemming. Logan was killed in a freak accident at Fergusson Park on Sunday afternoon, as he prepared to launch his kitesurfer in blustery conditions. A witness at the scene told a SunLive reporter that “(Logan) got picked up by the wind and slammed into the blue sign at the entrance near the gate to Fergusson Park. I’m not sure but I think he died instantly”. Glenn Bright, owner of Assault Boardriding Centre, says what happened was a really unfortunate incident from his point of view. Glenn says there could have been a lot of contributing factors which lead to the freak accident. “Logan is really well known to me and I’ve had a bit to do with him over the years, he’s a really confident kite boarder and confident sports person. “We all have a safety procedure or protocol that you follow when you are setting up and launching. It’s super important to follow. Sometimes things go wrong and you don’t have to ability to get out of trouble. 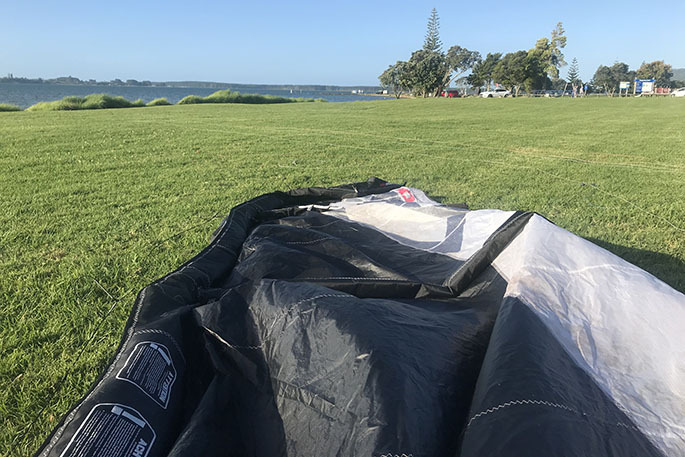 Glenn says it was a really busy day at the park on Sunday and thinks because there was a lot of kiting action happening, and not a lot of space to rig up, it could have contributing factor. Logan will be farewelled at a service held at Tauranga Boys’ College Gymnasium on Friday at 1.30pm. The 37-year-old is described as a dearly loved husband, beautiful father of three, treasured son and much loved brother and brother in law.